In India, getting a true unlimited broadband plan is quite rare these days. Most unlimited plans offered by telecom operators have a certain bandwidth cap, crossing which you’re automatically switched to a slower connection. However, there is one Internet service which offers affordable unlimited data plans, and the solution is portable as well. The solution is BSNL EVDO. In this article, we’ll discuss the important factors related to the setup and use of your BSNL EVDO connection, and look at different ways of extending their accessibility. EVDO (Evolution-Data Optimized) is a telecommunications standard for high speed wireless transmission of data on mobile devices. It is an evolution of the CDMA2000 (IS-2000) standard that supports high data rates and can be deployed alongside a wireless carrier’s voice services. An EVDO channel has a bandwidth of 1.25 MHz with a packet-based backend network. There are two variations of the EVDO — Rev. 0 and Rev. A. EVDO Rev. 0 supports download speeds of up to 2.4 Mbps, while upload speeds can go up to 153.6 kbps. EVDO Rev. A supports download speeds of up to 3.1 Mbps and upload speeds of up to 1.8 Mbps. As of now, BSNL only supports the EVDO Rev. 0 standard. That means, all EVDO connections offered by BSNL theoretically support the maximum download and upload speeds of 2.4 Mbps and 153.6 kbps respectively. BSNL EVDO also supports CDMA2000 1xRTT channel, which is a standard used before EVDO. With 1xRTT, the maximum supported download and upload speeds are both capped at 153.6 kbps. This support has been added as a backward compatibility to EVDO modems, so that they can switch to 1xRTT channel when EVDO signal is weak or unavailable. You can apply for a new EVDO connection by reaching out to the nearest BSNL office. You can also gather relevant information by talking to a customer support executive over the phone. However, before applying for a new connection, you should ensure that BSNL has a decent EVDO coverage in your area. If signal strength is weak in your area, download and upload speeds will be considerably slow, and you might not be able to use the EVDO to its full potential. If you can’t get a new EVDO connection in your region, you may also apply from a different region in India. All BSNL CDMA Prepaid EVDO connections come pre-activated with National Roaming (free) except Delhi & Mumbai. The Capitel CE200 is a CDMA2000 EVDO Rev. A dongle supporting wireless DSL-like speed up to 3.1 Mbps. It has a removable SIM slot and includes driver software for Windows, having features such as SMS, Phone Book, etc. Operating frequency band: 850 MHz. Supported standards: CDMA IS-95, CDMA2000 1xRTT, CDMA2000 EVDO Rev. 0, CDMA2000 EVDO Rev. A. Supported Download speeds: Up to 153.6 kbps (1xRTT); up to 2.4 Mbps (EVDO Rev. 0); up to 3.1 Mbps (EVDO Rev. A). Supported Upload speeds: Up to 153.6 kbps (1xRTT and EVDO Rev. 0); up to 1.8 Mbps (EVDO Rev. A). The ZTE AC8700 is a CDMA2000 EVDO Rev. 0 dongle supporting speeds up to 2.4 Mbps. It includes driver software for Windows, having a virtual dialer pad, voice call support, phonebook, SMS Manager and Call history. Operating frequency band: 800 MHz. Supported Operating Systems: Windows (Driver Software available), Linux, Mac OS X. Supported Download speeds: Up to 153.6 kbps (1xRTT); up to 2.4 Mbps (EVDO Rev. 0). Supported Upload speeds: Up to 153.6 kbps. The UE100 is a CDMA EVDO Rev.A Modem. It supports includes a Connection Manager application having Phone book, virtual dialer pad and SMS Inbox. It is also compatible with Linux and Mac OS X. The T-U500 CDMA 1X EV-DO Rev. A wireless data card supports laptops and other equipments with USB interfaces. T-U500 supports data, voice and SMS functions and includes driver software for Windows. The MMX 310C is a CDMA 1X EV-DO Rev. A wireless data card that includes driver software for Windows, having dialer, phonebook, SMS Manager and Call history features. An earlier version of this data card — the MMX 300C — with similar specifications, is also available. Supported standards: CDMA IS-95, CDMA2000 1x RTT, CDMA2000 1x EVDO Rev.0, CDMA2000 1x EVDO Rev. A. Supported Download speeds: Up to 7.2 Mbps. Supported Upload speeds: Up to 5.76 Mbps. All the above mentioned CDMA Data Cards will help you take the full advantage of BSNL EVDO, since all of them support the Rev. 0 standard. Depending on the EVDO dongle or the version of the driver software installed, you may or may not get support for a virtual dialer pad, which is sometimes useful for executing service specific USSD codes. Almost all of the EVDO dongles (provided by BSNL or otherwise) include driver software for Windows OS. The driver software helps you to easily configure the EVDO dongle for Internet access. Once the required settings have been configured, you can get connected to the Internet in one click. But using EVDO dongles on OS X or Linux might be challenging. On platforms such as OS X or Linux, an EVDO dongle might be useless without suitable driver software. 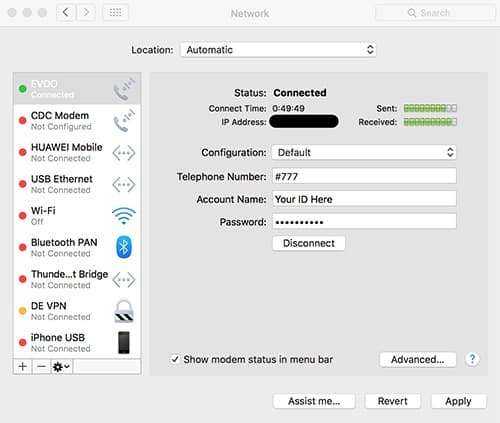 Some EVDO dongles include native network interface driver, so you may be able to configure them manually from the system’s network settings to get connected to the Internet. But you’ll miss out on the extra features (such as virtual dialer pad, SMS inbox, signal strength indicator, etc.) that might be included with its driver software on Windows. And then there are dongles which don’t support platforms like OS X and Linux at all. So, if you are using any platform other than Windows, ensure that you pick an EVDO dongle that supports it, or go WiFi. BSNL EVDO dongles are designed for personal use only. Internet access is only available to the (supported) device it’s plugged into. If you want to use the EVDO Internet connection on a platform for which suitable driver software is not available. Or if you want to use the connection simultaneously on multiple devices, a feasible solution is to tether it over WiFi. One of the convenient ways to tether an EVDO Internet connection over WiFi is to plug it to a compatible WiFi router. These days, many WiFi routers are available with support for tethering Internet connection from 3G/EVDO dongles. However, not all dongles are compatible with every WiFi router. Below are some of the WiFi Router – EVDO dongle combinations we have tested and found to be compatible. There may also be other compatible router-dongle combinations which are not mentioned here. If you do find such a combination, do let us know in the comments section. Sharing an EVDO Internet connection over WiFi has its own set of pros and cons. Let’s have a look at some of them here. Multiple devices can connect and share the same Internet connection. The devices connecting over WiFi can access the Internet connection irrespective of their OS and don’t require any driver software. Depending on the EVDO Data Card’s signal strength, such a setup has the potential of being a true broadband replacement. Its budget-friendly data plans also tip the scales in its favor. Devices accessing the Internet powered by an EVDO dongle over WiFi can’t access any of the additional features offered by the driver software, such as SMS Inbox or dialer pad access. Finding a suitable Router – Dongle combination is difficult. Note: As signal strength varies widely across different coverage areas, it is up to you to find the “perfect” spot for the EVDO dongle in your house, where signal reception is the best. Once the spot is found, you can set up the WiFi router there. One of the challenges of using the BSNL EVDO dongle is recharging it online. BSNL does not offer any official online portal for recharging prepaid CDMA connections. Even third party recharging sites like Paytm and Freecharge restrict the users to specific recharge amounts only, which may not match with BSNL EVDO tariff plans. So these sites are not suitable for EVDO recharge. There is however one portal, developed and maintained by some BSNL folks, that supports EVDO recharges online. The portal requires you to register an account linked with the 10 digit number associated with your EVDO connection; though there’s a catch. The portal only allows registrations of EVDO connections that have been applied from the South Zone. If your EVDO Card was applied from a different zone, you might not be able to register in this portal. Although, if successfully registered, you can recharge your EVDO without bar. For users from other zones, or for those who can’t register on the above mentioned portal, there’s another online portal called Reload.in that allows BSNL EVDO recharges. You may also try using any other online recharge portals that don’t restrict user input to specific recharge values, as well as support special recharge facility. If you need to extend the validity of your EVDO connection, try recharging it online. If the online validity recharge fails, do a Top up recharge of any amount so that the account balance is greater than ₹21. 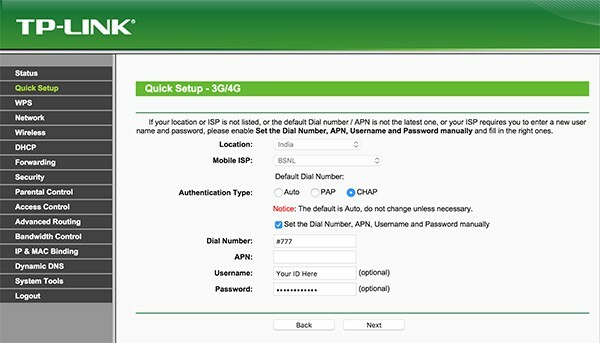 You can then extend the validity of your EVDO connection by dialing *789*2000# using the virtual dialer pad. An amount of ₹21 (180 days of validity) will be deducted from the available balance as service charge. Via USSD – Dial *123# to get account balance. Via call – Dial 123 or 18004259123 (Toll free). Via SMS – Send ‘AMT’ to 53733 to know detailed account balance. Via SMS – Send ‘STV <space> MRP’ to 53733. Applicable amount will be deducted from available balance. Via SMS – Send ‘LAST’ to 53733. Via USSD – Dial *789*2000# to extend EVDO validity by 180 days. ₹21 will be deducted from account as service charge. Note: The tariff plans mentioned above are subject to change without any prior notice. To know about the latest tariff plans offered by BSNL, visit this page or call customer support for assistance.